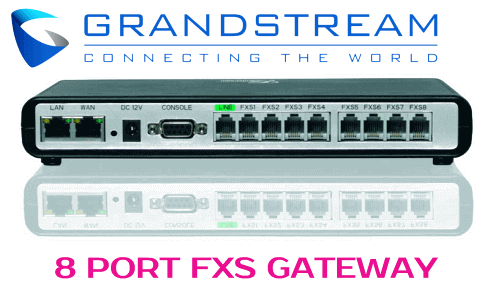 The Grandstream GXW-4008 Analog FXS IP Gateway provides small business and remote offices with a large enterprise quality solution for quite an amazing price. This system is easy to deploy, thanks to its VoIP FXS analog gateway option. This system has been designed and carefully tested for full interoperability with all the leading IP PBX and SIP-based devices. The GXW technology makes sure that the manageability is with a simple configuration, superb voice quality, and rich functionality. This series is based on the open industry standards of the day, something that adds up to its competitive advantage. The Grandstream GXW-4008 is an 8 FXS port gateway that lets the analog phones and fax machines along with other traditional analog PBX system to connect with a VoIP system as well as the provider. This gateway features 2 10/100 network ports that come with an integrated router to connect to the network and RJ11 line for the PSTN Failover. Not to mention, it also has the RS232 serial port that helps for better administration. This gateway supports two profiles per each SIP account with Caller ID for different regions and countries. Also, it also provides the support for T.38 fax, flexible dialling plans, security protection and the comprehensive voice codecs. This is a great solution for business that needs to connect with one or more than one line of traditional PBX to VoIP system line. Each of these systems supports two profiles with T.38 fax along with G.711, G.723, and iLBC codecs. The Grandstream GXW-4008 features a compact and quiet design. It has no fans but yet it provides the par voice quality. The voice quality is topped with the features like autoconfiguration, security protection, remote management, and unmatched scalability. It features up to 8 port FXS interface for analog telephones, dual 10m/100m network ports with integrated router, analog telephones lifeline for power failure and RS232 serial port for administration. Establishing VoIP network with Analog and IP gateway, this product provides your business the leverage to its overall existence with analog equipment with IP Network. This device also features an RJ11 failover line just in case the supply fails over the IP PBX. This product also features an integrated IVR automatic provisioning tools that help to handle the telecommunication work just for you. The Grandstream product has established itself as one of the most trusted IP Gateway in the market thanks to its following features.